As you already know FTPGetter stores all information on each ftp server it is working with, in a profile. Let's review connection settings for ftp server in detail. To connect to ftp server you need to set server address (as IP address or URL), port (21 on default), user name and password for logon to the server. To work via secure ftp protocol in implicit mode a special port is used on ftp server (990 on default). Don't forget to set this value. Connection errors handling and broken transfers resumption. You can set the number of server connection attempts and broken transfer resumption attempts in the server profile dialog. 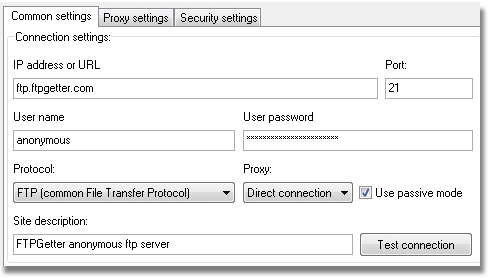 Now, if an error occurs during file transfer and the connection is broken, FTPGetter will attempt to resume the transfer from the breakpoint. You need to define additional connection parameters to work with secure ftp servers. User authorization method on the server. There are three methods available: using user name and password, using PEM/ASN1 certificate and key and using PKCS12 certificate. The first method is used by default. To get authorization on the server using PEM/ASN1 certificate and key you should define path on the drive to the certificate file, to file with the key and enter key verification password. To get authorization on the server using PKCS12 certificate you should define path on the drive to the certificate file and enter its verification password. Certificates and keys should be provided by your server administrator. Well, now you know how to customize connection to ftp server. It's time to consider creating ftp upload and download tasks.